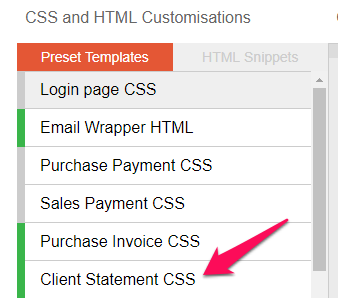 Hi, I’m trying to use the advanced customisation tools and css to add text that gives details of payment details. I guess this should be easy but css is new to me and I can’t see the template to change things around. Do you mean a column next to each payment? It isn’t possible at the moment. Generally, you can only move things and change the way they look using CSS. As the column for payment method isn’t there, it’s not possible to add it. However, if you wish I can change this thread to a feature request. We do actively monitor the forums for suggestions, and if there’s enough interest than we’ll happily take a look into it further. It is possible to insert extra content before or after an existing element using a CSS3 selector but that would only affect the HTML view in the client area, not generated PDFs as the PDF library doesn’t speak CSS version 3. @ian_Roberts is correct about the CSS3 and the PDF generator. I’ve updated this feature to “Planned”. We will start work on this within the next 3-5 days. Of course we will update you in due course! @clarkshaws @ian_roberts - Just a quick update to let you know that this has been added and is now live. That is looking good now. Thanks. Unfortunately I’ve spotted another problem on the statement (should have spotted it a long time ago). Near the top right of the statement below the summary box, there is a “Questions? Please contact us…” section. The email that appears is wrong. It doesn’t use the one set up in the trading styles section. That certainly shouldn’t be the case. I’ve asked our development team to take a look at the earliest opportunity and will come back to you once I’ve heard back. The text unfortunately is fixed so you wouldn’t be able to change it yourself. @richiekk - No problem! I’ve had an update from our developers saying this has actually been fixed and released this morning. Of course, you’re welcome to continue using the above fix if you prefer, but either way, it should now work as expected. Please let me know if you experience anything different. Ha! We thought we had performed magic when the customised emails started to appear! We have reversed the fix.